The Essence of Taijiquan is a highly valuable resource for those seeking to understand what Taijiquan is. 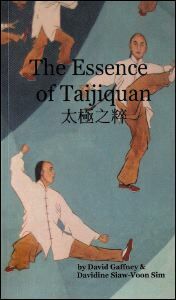 It offers a comprehensive explanation of the overlapping steps that lead to the fundamental skills that have made taijiquan such a famous martial art. The book is written in five sections. Topics include Understanding the concept of Qi, The three stages of Progression and Taijiquan as a combat art. The final chapter sees some of today’s leading practitioners give their insights into the multifaceted art of Chen Taijiquan.